UiT The Arctic University of Norway is a medium-sized research university that contributes to knowledge-based development at the regional, national and international level. UiT The Arctic University of Norway is the third largest in Norway and the northernmost university of the world. Its location on the edge of the Arctic implies a mission. The Arctic is of increasing global importance. Climate change, the exploitation of Arctic resources and environmental threats are topics of great public concern, and which the University of Tromsø takes special interest in. At UiT The Arctic University of Norway you can explore global issues from a close-up perspective. Life in the High North is shaped by wild nature, contrasting light and weather conditions, geographic distances and multiculturalism. Many of UiT´s research centres and study programmes reflect the specific character of Arctic Norway. UiT's study portfolia covers all classical subject areas from Health Sciences, Social Sciences, Education and Humanities, Science and Technology to Economics, Law, Social Work, Tourism, Sports and Fine Arts. UiT's key research focuses on the polar environment, climate research, indigenous people, peace and conflict transformation, telemedicine, medical biology, space physics, fishery science, marine biosprospecting, linguistics and computational chemistry. UiT´s Centre for Advanced Studies in Theoretical Linguistics, CASTL, and CTCC, Centre for Theoretical and Computational Chemistry, have both been designated Norwegian Centres of Excellence. In 2002 the Tromsø-based NST, Norwegian Centre for Telemedicine, was appointed a World Health Organization Collaboration Centre. The ARCTOS network at the Faculty for Biosciences, Fisheries and Economics, is a leader in research on marine arctic ecosystems and an important partner of the Norwegian Polar Institute in Tromsø. The Department of Physics focuses on northern lights and space research. All these institutes are of high international reputation. The university is part of the FRAM – High North Research Centre for Climate and the Environment (Fram Centre) in Tromsø. 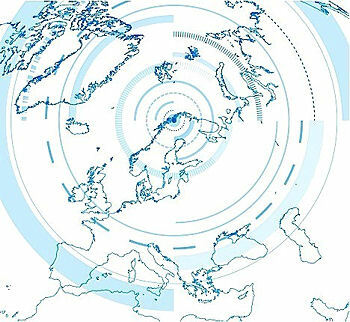 Every January the international conference Arctic Frontiers invites researchers, politicians and business representatives to discuss Arctic issues across disciplinary borders. The Secretariat of the Arctic Council is located at the Fram Centre. Researchers from the University and Fram Center are involved in several international programmes of the Arctic Council. 15500 students and 3300 staff study and work at UiT The Arctic University of Norway. Teaching is research-based. UiT´s eight faculties offer, in spite of a dedication to Northern issues, a broad range of study programmes. The academic community in Tromsø is highly international. More than 20% of the academic staff and 10% of the student body are from abroad. The University offers more than 20 English taught master´s degree programmes, and all faculties offer English taught courses at both bachelor’s and master’s level. UiT The Arctic University of Norway is a founding member of the University of the Arctic, an international network of 160 study and research institutions of the circumpolar region. But the University cooperates with all parts of the world. 200 international agreements secure an active academic exchange of students and staff with partner institutions worldwide. The University of Tromsø has been through three mergers. On the 1st of January 2009 UiT merged with the University College of Tromsø, and on the 1st of August 2013 with the University College of Finnmark. The latest merge was on the 1st of January 2016 with both the University College of Harstad and the University College of Narvik. After the merge UiT has become a multi-campus university spread throughout Northern Norway. The main campuses are located in Tromsø, Alta, Narvik and Harstad, with smaller departments in the towns of Mo i Rana, Hammerfest and Kirkenes. The number of students and study programmes increases due to this merger. The new university has become an even more important driving force for Northern Norway and international cooperation in the High North.